SANTA CLARA, Calif. (AP) - U.S. coach Jurgen Klinsmann realizes full well that a strong Copa America run on home soil could mean much to this country hosting another World Cup. The biggest soccer showcase in the United States since the 1994 World Cup kicks off when the 31st-ranked Americans take on No. 3 Colombia on Friday night at Levi's Stadium. "We want to do well, we want to get as far as we can in the tournament but we also want to showcase our game to the rest of the world because down the road we would love to host a World Cup again," Klinsmann said as his team prepared this week. "This is a huge opportunity for all of us to show everybody outside the U.S. that we are ready for another World Cup." After losing to Qatar in the 2022 vote, which led to corruption allegations against FIFA, the U.S. still hasn't committed to bidding to host in 2026. FIFA intends to hold a vote in May 2020. 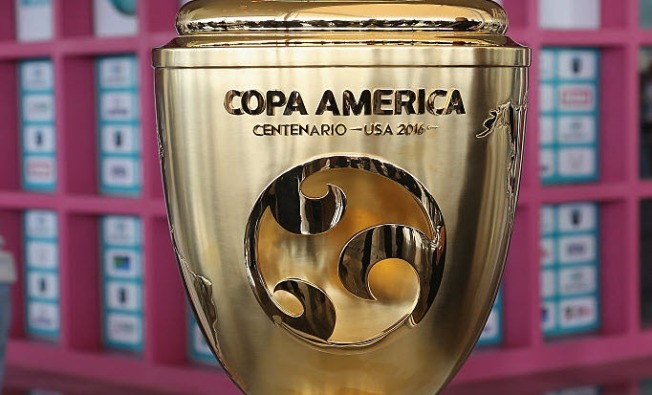 The Copa America is South America's championship, but a special 100th anniversary tournament was scheduled for this year and includes six nations from North and Central America and the Caribbean. Many of the soccer officials originally behind the tournament have been charged with crimes that include racketeering, wire fraud and money laundering conspiracy in U.S. federal indictments, and the U.S. Soccer Federation only agreed in October to go ahead with hosting the tournament, after the original broadcast and marketing contracts were terminated. Chile and Argentina face off Monday night at $1.3 billion Levi's Stadium - home of the NFL San Francisco 49ers - in a rematch of the 2015 Copa final. Playing at home last year, Chile beat Argentina and Lionel Messi 4-1 on penalty kicks for La Roja's first Copa championship. Argentina's senior team has not won a title since the 1993 Copa. It's unclear whether Messi and MVP pal Golden State Warriors star Stephen Curry will have time to swap jerseys with Curry in the NBA Finals. Brazil will compete without Neymar, who opted to play as one of the team's three over-23 players at the Olympics in Brazil - Barcelona would not let him appear in both events. The Selecao look to rebound from their poor World Cup at home two years ago and a stunning quarterfinal loss to Paraguay on penalty kicks in the '15 Copa. Klinsmann's Americans, part of Group A, take on 2014 World Cup quarterfinalist Colombia, which scored just one goal in four games in last year's Copa America before a quarterfinal defeat to Argentina in a shootout. This could be a further proving ground for 17-year-old Christian Pulisic to see if he and fellow newcomers Darlington Nagbe and Bobby Wood become regular starters. Pulisic, back from his impressive first season in Bundesliga, became the youngest American in the modern era to get a goal for the national team when he scored in last Saturday's 4-0 exhibition win against Bolivia. "You host a tournament and you have a group of players together that are very, very hungry. They want to prove themselves in this tournament," Klinsmann said. "It's a unique opportunity because Copa America is not coming along very often and I think they realize that. The training sessions have always been high energy, the attitude is great, the spirit in the group is great. They want to show the soccer world that we are ready here to compete." And Klinsmann is counting on a fresh start being good for goalkeeper Brad Guzan after a forgettable Premier League season with Aston Villa. As soon as he arrived in Miami for U.S. training camp, Guzan switched gears and he feels no added pressure to silence all his critics. He has played long enough in England to understand the scrutiny that comes with the job. He is focused on a strong showing now. "It's a huge tournament, a prestigious tournament to be a part of and for us to host it," Guzan said. "We know it's going to be a test for us in terms of rising to the challenge against these good teams. We're probably not the favorites to win the tournament whereas in qualifying and certain games we're probably expected to win more of those games than not." Guzan earned the starting job over veteran Tim Howard, who will join the Colorado Rapids after Copa America. "You just hope once he leaves the club situation behind him that he settles with himself and stays consistent in what he is doing with the national team," Klinsmann said of Guzan. "Over the last two years, he has been very solid, very consistent with us." U.S. forward Chris Wondolowski will play right at home in the Bay Area, where he stars for the MLS San Jose Earthquakes. "Soccer is a funny sport. There is never a team you should beat or you could beat," Wondolowski said. "Any time you win breeds confidence in your group. Friday is going to be a huge test. Much different than the friendlies, but we're ready."